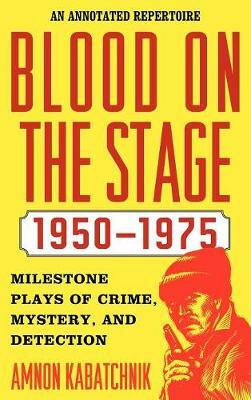 In Blood on the Stage, 1950-1975: Milestone Plays of Crime, Mystery, and Detection: An Annotated Repertoire, author Amnon Kabatchnik continues the focus of his previous volumes (1900-1925 and 1925-1950) and provides an overview of the most important and memorable theatrical works of crime and detection of this period. Addressing the development of this genre in the legitimate theatre, Kabatchnik discusses more than 120 full-length plays produced between 1950 and 1975. Arranged in chronological order, the productions cited are all works of enduring importance, pioneering contributions, singular innovations, and outstanding success. Many of the most notable playwrights of the era are represented, including Horton Foote, Bertolt Brecht, Arthur Miller, Frederick Knott, Joe Orton, Anthony Shaffer, Peter Shaffer, and Agatha Christie. Each of the plays featured revolves around murder, theft, chicanery, kidnapping, political intrigue, or espionage. Each entry includes a plot synopsis, production data, and the opinions of well known and respected critics and scholars. The plays in this era include psychological thrillers and baffling whodunits, among them such memorable works as Anastasia, Dial 'M' for Murder, The Mousetrap, The Crucible, Witness for the Prosecution, The Desperate Hours, Sleuth, and Equus.